Treating ourselves a little during the festive season never hurt anybody. But scoffing down a tonnes of pineapple tarts and going through a tub of crackers? Throats are bound to start hurting. What's worse, everyone at home is also coming down with a throat inflammation thanks to these heaty snacks. According to the British Medical Journal, sore throats tend to come with a cold and are typically of viral origin. Enter Difflam Forte Anti-inflammatory Throat Spray, your trump card this Chinese New Year. The soothing spray relieves pain and swelling in the mouth and throat by acting as a local anaesthetic. It triggers numbness, and you can experience pain relief in as little time as from 60 seconds* onwards once it's sprayed on, thanks to its key ingredient, benzydamine hydrochloride. This active ingredient helps reduce inflammation, the primary cause of sore throat pain. A sore throat spray that works almost immediately? Yes, please. 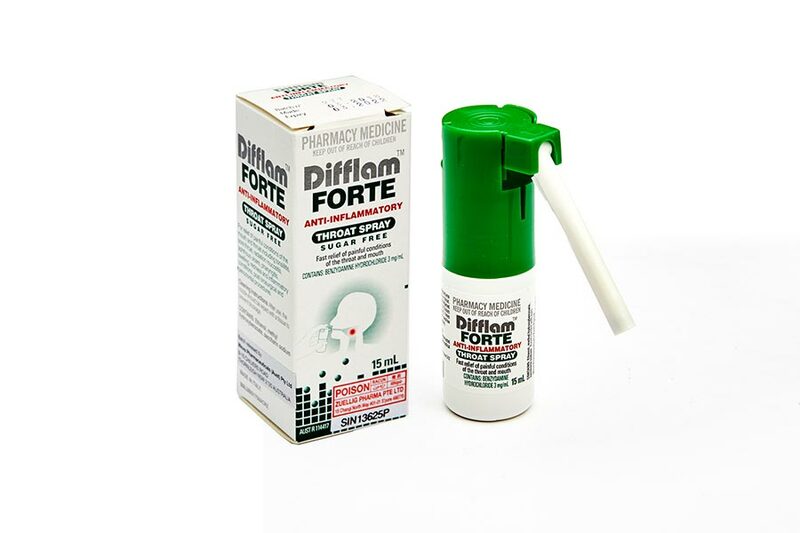 Difflam Forte Anti-Inflammatory Throat Spray, with its long nozzle, makes it easy to aim for the back of your throat (or the ulcers in your mouth). It allows you to target the affected areas with just the right amount for fast-acting relief. All you need is two to four sprays, every one and a half to three hours. It gets better: The spray is available behind the counter through a pharmacist and tastes minty-fresh. It's also sugar, lactose and gluten-free, so anyone with common food allergies will still be able to use the spray. The spray is suitable for children as young as six years old (for six- to 12-year olds, two sprays onto the troubled spot every one and a half to three hours is the recommended dosage). Near immediate relief for an uncomfortable sore throat is the best red packet anyone can get. For further information, please refer to the Product Information Leaflet. If symptoms persist, please consult your health-care professional. Individual responses may vary. Brought to you by Difflam Forte.